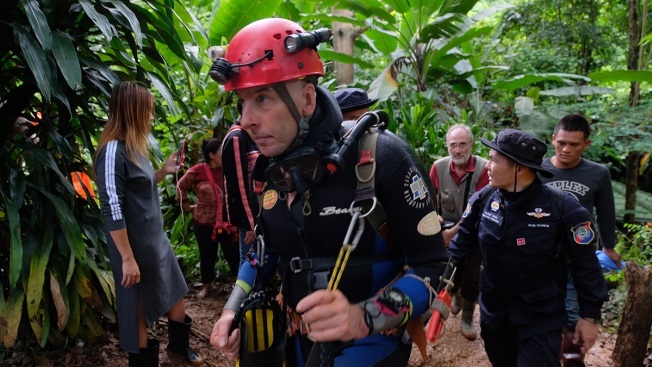 British cave-diver Richard William Stanton walks out from Tham Luang Nang Non cave in full kit without any response to reporter's questions on June 28, 2018 in Chiang Rai, Thailand. Rescuers battled heavy rain in northern Thailand as they continued the search for 12 boys and their soccer coach who have been missing in Tham Luang Nang Non cave since Saturday night after monsoon rains blocked the main entrance. Teams of Navy SEAL divers worked their way through submerged passageways in the sprawling underground caverns as senior Thai government officials warned on Wednesday that time is running out and the search intensifies for the young soccer team, aged between 11 to 16, and their their 25-year-old coach, with soldiers and park rangers seeking other entry points into the cave system. The search effort in the northern province of Chiang Rai has been going slowly, largely because flooding has blocked rescuers from going through chambers to get deeper into the cave. The boys, aged 11 to 16, and their 25-year-old coach entered the sprawling Tham Luang Nang Non cave after a soccer game on June 23, but near-constant rains have thwarted the search for them. Authorities have nevertheless expressed hope that the group has found a dry place within the cave to wait, and that they are still alive. Reflecting that hope, a medical evacuation drill was held Saturday morning to see how long it would take to get rescued people out of the cave, into 13 ambulances and to the nearest hospital. Australian police and military personnel were deployed Saturday to join other multinational teams, including U.S. military personnel and experts from a British cave exploration club. China has sent a six-person team of rescue and disaster experts to the cave, the Chinese Embassy in Bangkok announced Friday. The group has experience in lifesaving rescues in Myanmar and Nepal, the embassy's statement said. A second, private Chinese group, calling itself Green Boat Emergency, arrived Saturday. "Our skills are search and rescue on mountains and in caves. We hope we can help," said Wang Xudong, a member of the group. Chiang Rai Gov. Narongsak Osatanakorn said the falling water level in the cave has helped the rescue effort considerably. "Today the situation is much better and we have high hopes, and will be here all night," he said early Saturday evening. Thai navy SEAL divers have been crucial to the search, but have been stymied by muddy water reaching the cave's ceiling, forcing them to suspend operations again and again. With water levels dropping, they resumed dives Saturday, re-entering a chamber from which they had retreated earlier in the week. In addition to pumping out the flooded chambers, there have been efforts to find the source of the water flooding the cave in order to drain or divert it. Chaiwat Dusadeepanich of the Department of Groundwater Resources said Saturday that his team, which has been drilling for two days, found a small underground water source near the cave. "But the water flow rate isn't great enough," he said. "We would have to drill in deeper to get to the source, but at least we found it. Hopefully we can start pumping out the well water by the end of today." Hopes were also high for finding some kind of access through fissures on the mountainside that might lead to shafts into the cave. "Yesterday our team climbed into one shaft, and went in around 50 meters (yards)," said National Deputy Police Chief Wirachai Songmetta. He said the shaft had led to two separate chambers so far. "Today we will re-enter the second chamber that we found and try to find passages that could lead to other chambers," Wirachai said. Officials said Friday that they were dropping care packages into the shafts in hopes the missing might retrieve them. Each package contains food, beverages, a phone, a flashlight, candles, a lighter and a map of the cave.